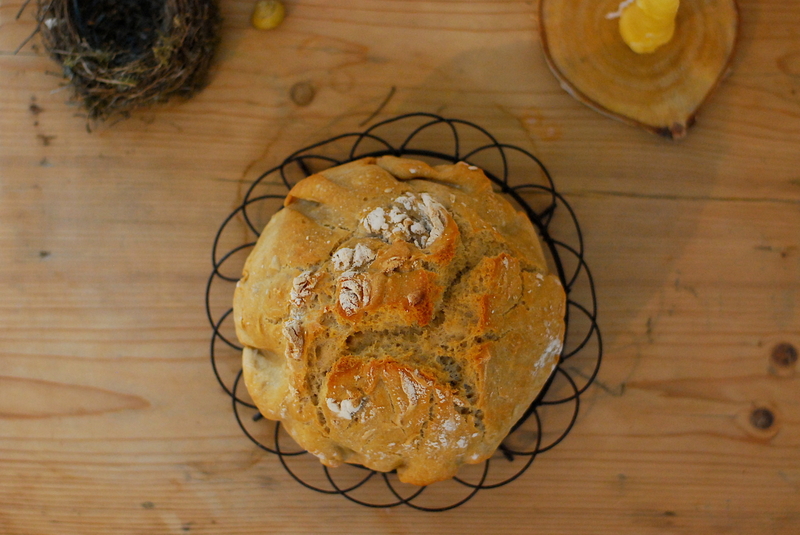 So, I know I already posted one bread recipe a while ago but this one is even better. Although it takes no time to make, it does contain yeast, meaning it requires a couple of hours of rising time. But let me tell you – the end product will be bread that looks and tastes store bought! 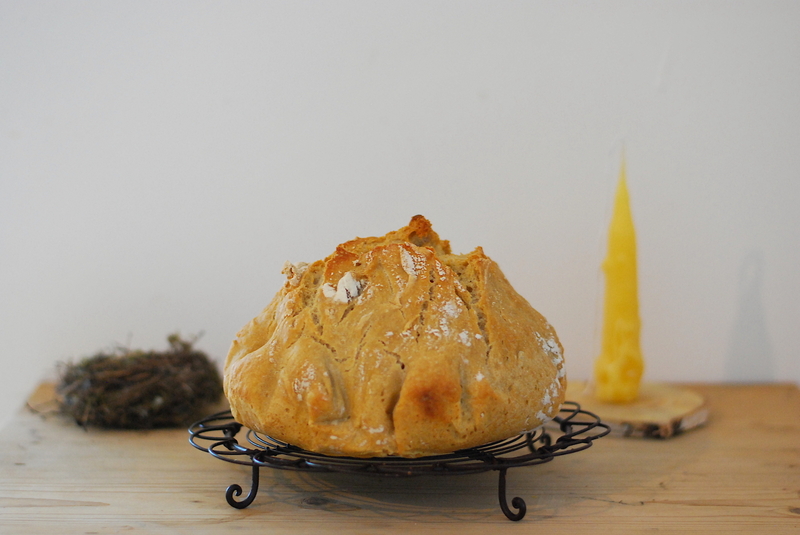 We are all crazy about this bread and have made it a little too many times in the last month. Yikes! Thank God the summer is gone. First mix all the dry ingredients in a large bowl and than gradually add water and mix well so there is no flour on the sides of you bowl left. Cover with a towel (I put an elastic band around it to make it really tight) and leave for at least 3 hours or overnight. Set your oven to 250C (450F) and put an empty dutch oven inside with the lid on. Both the oven and the inside of the dutch oven have to get really, really (really!) hot. Start preparing the bread: dust your work surface and scoop the dough out on to it. Dust your hands well and fold the dough a couple of times and place it into a well-dusted bowl (or proofing basket). Let it rest for at least half an hour. Now that your oven is hot enough, carefully dump the bread onto a lightly greased parchment paper, transfer it into hot dutch oven and cover it with the hot lid. Place the dutch oven back into the oven for 45 minutes and if you want your crust to be extra crispy and dark, take the lid off and let the bread bake uncovered for another 5-10 minutes. WARNING! Once you make this bread you’re unable to stop and you never ever want to but another loaf of bread! It is THAAAT good! Do yo trim the parchment paper to fit the bottom of the Dutch oven? Would love to have a bit more detailed instructions on this part. Thank you! Hi Jen! No, you just take a piece of parchment paper and then lift the bread together with the paper. I’m sorry I didn’t take photos of this step but if you google “bread dutch oven paper” you’ll see the photos of how is it suppose to look. Hope this helps. How much water do ou add? Cups? Ups, so sorry Nainde – I corrected that part now. It’s cups, yes! Thanks so much!!! This bread was sooo good,wet in olive oil 😋 ( and easy!) now I think I’m gonna make it everyday 🙈🙈, with different things… thinking olives and caramelized onions, rosemary, etc etc, the choices are endless!! My kids and I were excited to make this, and we even let the dough rise overnight, but I just realized that the knob on our Le Creuset is only heatsafe to 190C/375F, so I cannot leave the lid in the oven. Do you think this recipe would work with an aluminum foil cover? Silly me, we took the knob off while baking and problem solved. The bread was delicious! Our dough was super wet and gooey in the morning and didn’t rise as much as I would have expected. Maybe the yeast wasn’t good? And thoughts? We used einkorn flour. Also, is there really no kneading?